South Ho Siu Nam graduated from the Hong Kong Polytechnic University in 2006. Ho’s artistic practice began with photography and has since evolved to the inclusion of performance, drawing and mixed media installations. His works encompass the wonders and helplessness of living, the spirituality of existence, as well as the socio-political awareness of Hong Kong. Ho participated in group exhibitions in various international institutions, including LOOK/17 Liverpool International Photography Festival (Victoria Gallery and Museum, Liverpool, UK, 2017); “Breathing Space” (Asia Society, Hong Kong, 2017); “Works in Progress” of the CHINA 8 project (Museum Folkwang, Germany, 2015); and “Basically. Forever” (Kiyosato Museum of Photographic Arts, Japan, 2014). In 2009, he was awarded the Hong Kong Contemporary Art Biennial Awards. His work is collected by the Burger Collection, Hong Kong Heritage Museum (Hong Kong), Legislative Council of Hong Kong (Hong Kong), Kiyosato Museum of Photographic Arts (Japan) and San Francisco Museum of Modern Art (USA). 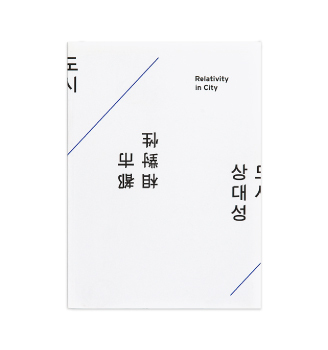 Publications by the artist include Every Daily (2013), good day good night (2015), and Space and Energy (commissioned by Tai Kwun, 2017). Ho currently lives and works in Hong Kong. In 2013, he co-founded 100 ft. PARK, a non-commercial art space dedicated to providing an open platform for exhibiting and sharing art. South Ho’s installation Drunken Life Dying Dream includes beer brewed by the artist, a wooden table split and recombined, and dim lighting from lanterns. Inspired by the eponymous amnesia-inducing wine in the film Ashes of Time (Wong Kar-wai, 1994), Ho stages a setting where two people have shared a drink at the table and have since departed. The artist accordingly brews two kinds of beer, a sweet “Drunken Life” and a bitter “Dying Dream”. Through the audience’s drinking, sharing, interacting, intervening and participating, the artist creates a communal atmosphere and group experience. In the installation, the table is split and recombined with bad precision and errors. A rotating lantern fabricated from a bamboo basket, Spinning Sky, is placed above the table and projects animated shadows that imitates the topsy-turvy world after intoxication. At the corner, a stationery bamboo lantern, Bird Cage, illuminates the scene dimly. The photographs behind the table is made with double exposure on film, creating a visual metaphor for how our city is soaked in alcohol and bathed in bubbles. Since 2013, Ho has been incorporating the element of painting into his photography. 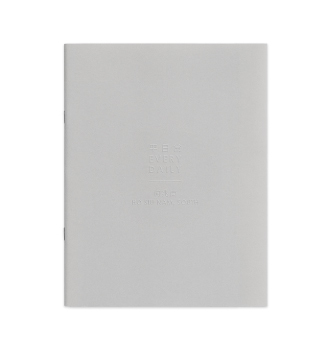 In Not Every Daily, Ho replaced the colourful blocks with stripes of different shades of grey. To the artist, these stripes of uniform width resemble signs of authority, restriction and control. The Umbrella Salad is a series of black and white photographs and videos capturing scenes of the Occupy Movement. Unlike the prevalent documentary approach taken by most photographers to record the events, Ho took an indirect approach filled with symbols and metaphors to representing his personal experiences and the surrounding presences. Scenes of clashes between the police and the protesters are replaced by objects discarded on the road like barricades, umbrellas, used water bottles and tents. People appear small and insignificant against the backdrop of the city, which looks quiet and peaceful amidst undercurrents of intensity and chaos. Open Door is a series of black and white photographs of scenes of the Occupy Movement surrounding the Hong Kong Government Headquarters, which is famous for its architectural design of joining the two wings of the buildings at the upper level, creating the visual metaphor of an opening door at the space below. In the image, the “open door” becomes a blackout. The effect is achieved by the artist cutting out directly on the negative film. Defense and Resistance (2013) combines photography and installation to illuminate the post-handover conflicts in Hong Kong. Every Daily is Ho’s first to incorporate the element of painting, based on a collection of black and white photographs of Tin Shui Wai, one of the largest new towns in Hong Kong where he lives. While the artist picks the colour of each block by throwing a dice, Ho fills the sky between the densely packed residential buildings with uniformly sized blocks on the photographs using the paintbrushes left by his late father. Through the mechanical and monotonous process of painting blocks, Ho attempts to reach a meditative state of self-healing for the loss of his father. This series is a set of photographs of the ever-transforming colors of the sky, which questions about eternity and explores the relationship between impermanence and eternity. 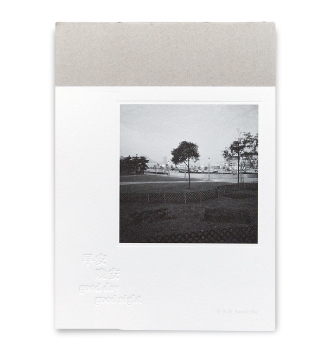 Some photographs in the series were captured when the artist was encountering some important moments in his life. The changing colors of the sky is a metaphor of how Ho perceives life; as change of nature is always beyond our control, just as change in our lives. He realizes the only real constant in life is the change itself. The series is a set of black and white photographs of pedestrian tunnels, taken at different locations in Hong Kong during the nights. The series expresses Ho’s view and feelings about a state of his life.The series of works is produced with traditional silver halide process, and each piece of work is hand printed by the artist. Ho was awarded the Hong Kong Contemporary Art Biennial Awards 2009 with this series.